What is the difference between multispectral and hyperspectral imagery? 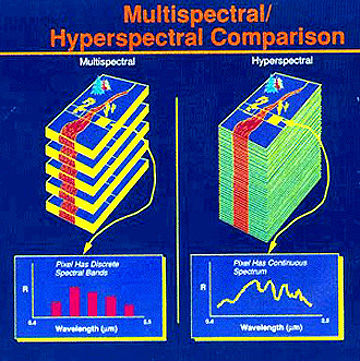 Multispectral imagery is produced by sensors that measure reflected energy within several specific sections (also called bands) of the electromagnetic spectrum. Multispectral sensors usually have between 3 and 10 different band measurements in each pixel of the images they produce. Examples of bands in these sensors typically include visible green, visible red, near infrared, etc. Landsat, Quickbird, and Spot satellites are well-known satellite sensors that use multispectral sensors. Hyperspectral sensors measure energy in narrower and more numerous bands than multispectral sensors. Hyperspectral images can contain as many as 200 (or more) contiguous spectral bands. The numerous narrow bands of hyperspectral sensors provide a continuous spectral measurement across the entire electromagnetic spectrum and therefore are more sensitive to subtle variations in reflected energy. Images produced from hyperspectral sensors contain much more data than images from multispectral sensors and have a greater potential to detect differences among land and water features. For example, multispectral imagery can be used to map forested areas, while hyperspectral imagery can be used to map tree species within the forest. 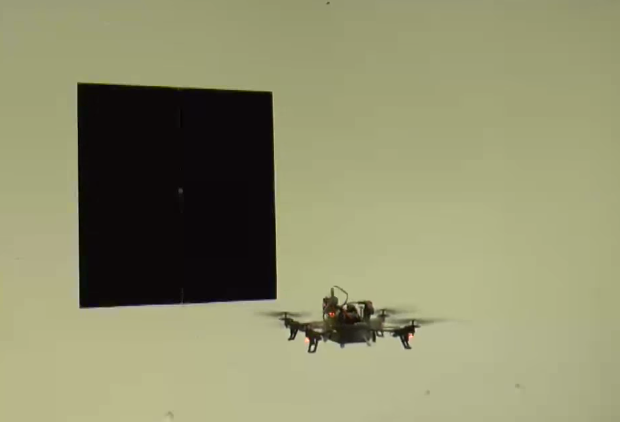 This entry was posted in Hardware, Sensor and tagged Hyperspectral, Multispectral on April 30, 2015 by enddl22. Maybe we won’t need to wear a reading glasses while working with a computer like screen in near future. Recently, an interesting work has been published in SIGGRAPH2014, named “Vision-correcting display lets users ditch their reading glasses”. I can’t quite understand the principle behind this, but it seems to allow people working such as reading an articles or writing on a paper without glasses. We’ve seen a number of glasses-free 3D technologies in recent years, most famously in Nintendo’s 3DS, but now researchers at the University of California at Berkeley and MIT have created a prototype device that allows those with vision problems to ditch their eyeglasses and contact lenses when viewing regular 2D computer displays by compensating for the viewer’s visual impairment. The prototype device consists of a screen printed with a matrix of pinholes measuring just 75 microns in diameter and separated by gaps 390 microns wide. This printed pinhole screen was then inserted between two layers of clear acrylic and attached it to an iPod display. Using an algorithm that takes into account a person’s eyeglasses prescription, the screen is able to compensate for an individual’s specific visual impairment by adjusting the intensity and direction of the light emitted from each screen pixel. In this way, by way of a technique called deconvolution – a process of reversing optical distortion similar to that used to correct images on the Hubble telescope’s distorted mirror – the light from the image that passes through the pinhole matrix will be perceived by the user as a sharp image. In a trial to test this set up, the team used a camera whose lens was adjusted to emulate farsightedness in a human eye, and then displayed images to that camera. When the image-correcting matrix was placed between the screen and the observing camera, the image resolved into sharp focus. Currently, the device also requires that the viewer remain in a fixed position for the matrix to be effective. However, Fu-Chung Huang, who is lead author of the study, says that eye-tracking technology could be used in future to allow the displays to adapt to the position of the viewer’s head. He says the team also hopes to add multi-way correction that would allow users with different visual problems to view sharp images on the same display. In addition to common problems such as farsightedness, the team says the technology could one day also help those with more complex problems, known as high order aberrations, which eyeglasses and contact lenses are unable to correct. The research team’s will present their findings at SIGGRAPH 2014 (Special Interest Group on Graphics and Interactive Techniques) conference in Vancouver, Canada on August 12th this year. Their paper is published in the journal ACM Transactions on Graphics. The following video shows the prototype screen in use, and explains some of the background to its development. This entry was posted in Hardware, Sensor and tagged deconvolution, vision-correcting display on July 31, 2014 by enddl22.